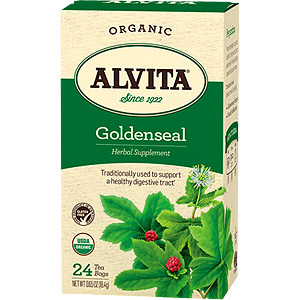 No herb was more revered by American Indians than the versatile Golden Seal (Hydrastis canadensis). Once flourishing in the moist, rich woodlands of the Northeast, they called it "yellow root" and used the brilliant golden juice extracted from its roots as an ornamental dye for their clothes and weapons, a paint for their faces, and for its health benefits. 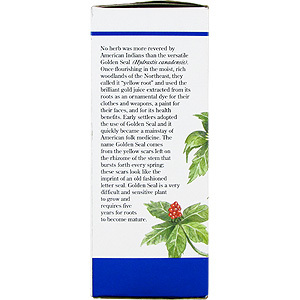 Early settlers adopted the use of Golden Seal and it quickly became a mainstay of American folk medicine. The name Golden Seal comes from the yellow scars left on the rhizome of the stem that bursts from every spring; these cars look like the omprint of an old-fashioned letter seal. Golden Seal is a very difficult and sensitive plant to gro and requires five years for roots to become mature. The best way to make a good tasting cup of tea is by the infusion method. Place one tea bag into a cup and add no more than 6 oz. of boiling water. Let steep for 3 minutes and remove the bag. Press the bag before removing to enhance the flavor. Add honey to sweeten. 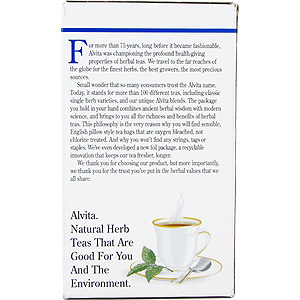 I gave this tea to my mom because she has asthma and it has helped her soothe it. She loves the taste and how it works miracles. 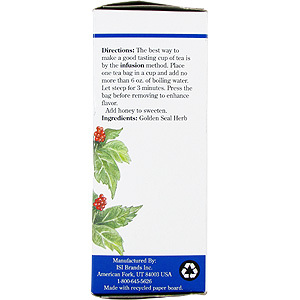 Goldenseal Herb Tea is shipped in a discrete, unmarked package. Orders are processed immediately and usually take about 3 to 5 working days to be received. We do ask that you try it for 2 to 3 weeks to feel the full effects. Any information received is used only for order processing and shipping purposes. Your information, such as e-mail address, will never be disclosed to a third party.